Homelessness in Glasgow is not being dealt with effectively. As an anti-capitalist site, Conter would contend that the issue is symptomatic of a market-driven system. Hoarding of wealth and resources has led to a situation where an estimated 105,000 properties are unused in Scotland. This is nothing short of criminal in a country where thousands of people make homeless applications every year - many of whom take to sleeping rough with no visible options in sight. We utterly reject the notion that this situation is somehow normal or unpreventable. The Scottish Housing Regulator concluded this year that Glasgow City Council "is not housing enough people who are homeless quickly enough" and "[over] 2016/17 it housed around half of those it had a duty to house". The scale is noteworthy: the council received applications for assistance from 5,377 households between 2016 and 2017. The council also had a duty to make an offer of temporary or emergency accommodation to households on 10,350 occasions, but made an offer in only 60% of these. 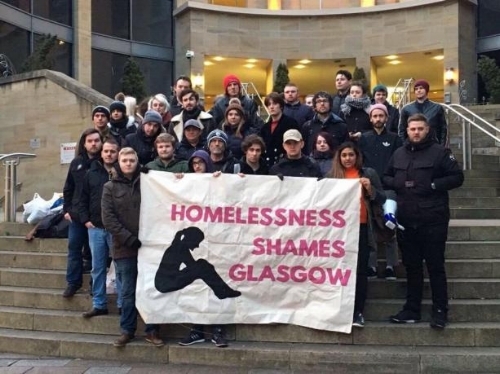 This month, there were protests outside the city chambers after it was revealed the council had breached its legal duty by failing to offer temporary accommodation to homeless applicants more than 3,000 times in a year. How do we fight back against this? This guide will provide information on campaigns and tactics whilst acknowledging that serious change can only be achieved through collective education and organisation. As made similarly clear in our guide on benefit sanctions, information on shelters, food provision, outreach etc. is sourced from volunteers, activists, government websites and charities such as Shelter and does not constitute professional advice. However, this shared information may prove useful and essential for emergencies. We present this guide itself to inform activists who seek to help, get involved or direct people responsibly. An important point to make here: you don't have to be living on the street or sleeping rough to be homeless. Homelessness can mean staying in a hostel, sleeping on a friend's sofa, being disabled or sick and living in unsuitable housing, or living in any kind of accommodation, no matter how unsafe or crowded it might be. There's a tendency to assume that any accommodation is better than no accommodation, but homeless people have a myriad reasons to feel unsafe or unsure about crowded shelters or hostels with strangers. Hostels are supposed to only be a "short term solution", but the number of homeless people in Scotland staying in hostels has increased by 43% over the past eight years. To be clear, hostels are not a solution to the housing crisis, which is why campaigns for more social housing, safer accommodation and a crackdown on second homes are so essential. What available options are there in emergencies? A scarcely known fact that should be reiterated at every point: every single person in this country is legally entitled to somewhere to stay. The Housing (Scotland) Act 1987 states that the council must provide you with temporary accommodation if required. If you don't have a place to stay, the first stop is to make a homeless application to the council (this goes for every council in Scotland, not just Glasgow). This can be done with any of the community casework teams in the city - listed here. The council must provide you with temporary accommodation in the short term and are required to investigate whether they can offer you permanent accommodation in the long term. A full list of emergency accommodation links in Glasgow are provided here by Shelter. As said before, hostels shouldn't be treated as a long term solutions and night shelters often fill up fast. However, as stated above, as legal requirements have not been adhered to by Glasgow City Council in many instances, the onus is unfortunately on activists to persist in campaigning and put pressure on the council to ensure it lives up to its duties. Rights hubs run by the Govan Law Centre can provide you with legal letters to present to the council threatening them with "judicial review" unless you are accommodated. For more information on your rights in terms of benefits and entitlements, here's a useful page from Shelter. CASE STUDY John Paul (who provided vital insight for putting together this guide) slept rough for several months. In a CommonSpace piece, he describes the Glasgow homeless system as "broken". He says: "The numbers of people dying are disturbing... The SNP is, depending on how you think, unwilling or unable to address the housing crisis, while Scottish Labour ran the council’s existing infrastructure into disrepair. Meanwhile, assaulting peasants is a traditional pastime for the Tories." - Simon Community RSVP - Street outreach service. - Barnardo's Safer Choices - Support for children at risk of sexual exploitation. - NHS Open Road - Support for men at risk of sexual exploitation. - Routes Out Drop In - Support for women at risk of sexual exploitation. - Hunter Street Services - Full range of healthcare services and addiction support. - Turning Point Scotland - Needle exchange. - Glasgow City Mission - Christian group providing free food, showers, activities. - Marie Trust - Day service offering advice, support, food, clothes, showers etc. - The Wayside Club - Night service offering food, clothes, shower, advice etc. - The Space - Pay-what-you-want venue that also offers free food drop in and clothing. - Big Issue - Offers people support, advice and opportunities to work. - Lodging House Mission - Food, showers, activities etc. - Kagyu Samye Dzong - Buddhist group providing free food three times a week. The above links also link onto several other resources. Note, for free food, there are also numerous foodbanks in the city. A full list is here. How safe are these places? "You have to look at it from different aspects. How do you stay safe when you're sleeping rough? The simplest answer is that some resources can 'increase your safety' but don't make you safe. Making friends when sleeping rough can actually be a hindrance rather than a help because of dependence and so on. Not everyone is helpful, but most people are. For women, it's very risky to be sleeping rough - so I'd really advise them go to groups like the Simon Community as a first port of call." - What's the government doing on this? The Scottish government say that Scotland has among the strongest rights in Europe for people facing homelessness. Some of the action they have taken is positive: abolishing Right to Buy to protect over 15,000 homes from sale and building more council houses (albeit at too slow a slow pace). But the government's pledge to invest £3 billion to deliver 50,000 'affordable homes' begs the question - affordable to whom? Statistically, the number of people making homelessness applications in Scotland has increased over the last year (after it has decreased over the last ten years). Why is this? The government operates a preventative approach in the form of new housing options, but this is not enough. There needs to be greater engagement with the root causes of homelessness and deprivation. A socialist analysis of this issue is absolutely vital and necessary. Whilst it must be acknowledged that everyone is unique and faces their own issues, only collectively can we truly fight back against the systemic causes. Cuts to public services, targeted austerity and a broken welfare system are all key drivers of deprivation. Over 10,000 households live in temporary accommodation in Scotland currently - in 2015-16, 24 weeks was the average length of time spent by a household in temporary accommodation. The Scottish Government announced last month that it had pledged £21m of a £50m fund to rapidly rehouse people in temporary accommodation and mitigate some of the UK government's savage cuts to welfare. However, the Scottish Government can do much more by stopping cuts to local councils and other services for starters. And on top of all this: the government needs to build more houses. Tens of thousands of people are on housing waiting lists for months at a time. We need an increase in clean, good quality housing for everyone. I want to campaign on this issue - how can I get involved? First off, to fight back we must collectively educate and organise ourselves. We can fight back against exploitative landlords, who often drive vulnerable tenants out of their properties, by joining Living Rent, Scotland's tenants union. We can campaign and hold Glasgow City Council to account through protests, meetings and direct action. Homelessness Shames Glasgow has done brilliant work to highlight the shame and injustice of people sleeping rough in the city. Meanwhile, Shelter are hosting a free public meeting on Thursday August 9: you can make sure your voice is heard and call out Glasgow City Council for breaking the law over 3,000 times in the last year. You can also encourage fellow activists to take direct action and join with like-minded people who are willing to take direct action in their communities. In the winter, RISE activists occupied 190 Trongate to raise awareness about homelessness, landbanking and lack of housing in this city. Rich people sit on properties in this cities and buy up land while thousands make homeless applications. It's unacceptable and a contributing factor to the council's own lawbreaking. Occupations are therefore a legitimate and important tactic. On a day-to-day basis, we'd also encourage activists to volunteer, donate money, donate food, donate clothing and offer any meaningful support they can to the various services outlined in this guide. Talk to people struggling with housing: sometimes they're our family, friends and colleagues; sometimes they feel completely isolated. Homelessness is Glasgow's shame, but people who are homeless in Scotland shouldn't feel any part of that shame. It's the fault of wealthy property owners, weak or cruel governments, and a capitalist system where profit is placed above people's lives. Join the fight back.